A normal mole is supposed to be one color, or at least, two shades of a color. But brown and grey are two completely different colors. Is this melanoma? “It could be normal, but if the mole demonstrates variegation in color, this is a possible feature of melanoma and you should get it checked,” says Hadley King, MD, a board certified dermatologist who specializes in medical and cosmetic dermatology. “Also look for asymmetry, border irregularity and change,” says Dr. King. Adults who’ve decided to inspect their moles for the first time would not be familiar with how their moles “are supposed to look,” as far as their longstanding history. Melanoma screening guidelines usually mention a change in a mole’s color as a suspicious sign. • Did that brown mole always have the grey? • Or was the mole originally greyish, and has recently acquired the brown area? A person can always keep a close eye on this mole, checking it every month along with the rest of their skin for any concerning signs for melanoma. 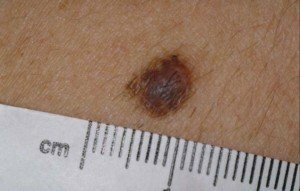 If that grey and brown mole has melanoma in it, or the entire lesion IS a melanoma, a person would not necessarily detect change 30 days later with the next self-skin exam. • One’s attention to detail or memory might not be all that great. • The spot may be located in an area where a person cannot get a really close inspection of it. There are apps that are designed to detect changes in moles over time, but these apps do NOT diagnose. They only alert to changes. If this brown and grey mole has other concerning features, such as an erratic border, a funny shape or is at least the diameter of a pencil eraser, your index of suspicion should be much heightened. Rather than wait months for an app to detect a change over time, you should see a dermatologist for that particular mole, as well as for getting an overall clinical skin exam. A dermatologist won’t have a reference point with that brown and grey mole, as far as what it looked like six months ago. But the doctor can view it with a dermatoscope, which may show features indicative of melanoma. If the doctor recommends a biopsy (a dermatoscope does not diagnose), the patient should agree and not worry about pain or scarring. Mole removal requires an injected anesthetic; you’ll barely feel the needle. It hurts less than a paper cut. The scar will be barely visible. Dr. King explains, “Seborrheic keratoses are very common benign skin growths that can be brown and grey — and asymmetric with an irregular border. Cluster of seborrheic keratoses. These lesions can also appear singularly. These harmless skin barnacles usually begin occurring after age 40. If you’ve noticed a cluster of brown and grey “moles” in close proximity, this is a reassuring sign for seborrheic keratosis — but do see a doctor anyways just to be 100 percent sure. 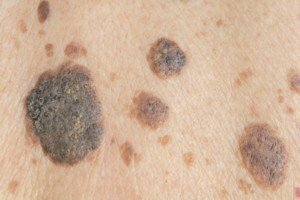 If you’re 20-something, it’s less likely that a brown and grey mole-like lesion is a seborrheic keratosis. But that doesn’t mean melanoma is the only other thing it can be. It’s also possible that the light you’re viewing the spot under is creating the illusion that it has a grey area. If normal pigment cells are deep in the dermis (second layer of skin), this can give the benign mole bluish-grey areas. The lesion at the very top of this page is a normal mole, appearing as a mix of brown and grey. Make an appointment with a dermatologist for an exam. Get it over with. If it turns out to be melanoma, keep in mind that when caught early, it’s highly curable.